Midnight Sun follows Katie Price as she battles with breaking the rules, her love life,and her life threatening disease- XP. Of all the interesting movies playing in movie theaters today, Midnight Sun was not on the top of my list. The trailer itself looked like a typical disease ridden sappy romance movie, and it felt like the story was already overdone with similar movies like The Fault in Our Stars, and Everything, Everything. Despite this opinion, movies like this are always making waves in the box office and ticket sales go through the roof. 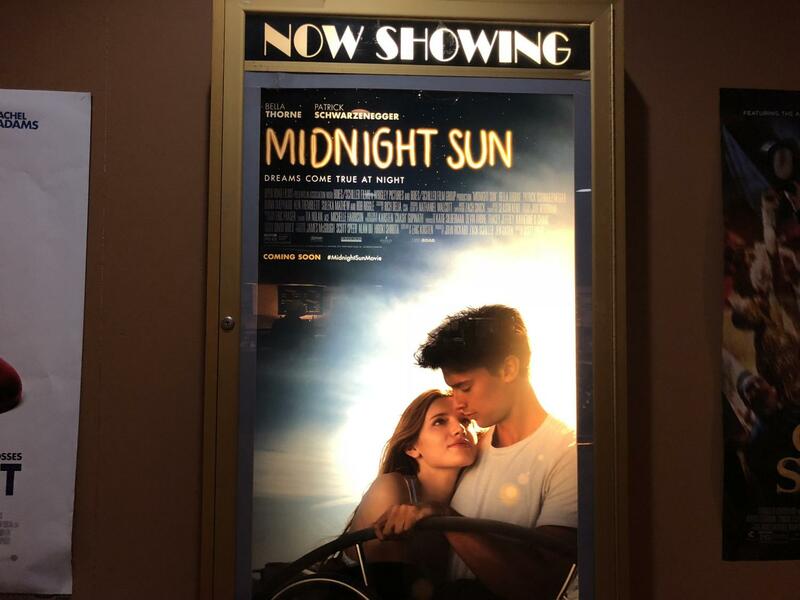 Midnight Sun follows main character Katie Price (Bella Thorne) who suffers from Xeroderma pigmentosum or XP- a life threatening skin disease triggered by ultraviolet light caused by the sun. Katie stays inside all day long and goes out at night, constantly living her life in the shadows. She has one friend, a dad, a doctor, and a boy she stalks outside her window everyday. One night, she comes face to face with the boy she watches skate by her house everyday and everything changes. Charlie becomes smitten with Katie, and Katie can’t help but live through the fantasy of “being someone more than just a disease.” Her secret disease soon draws a rift in the relationship, putting strain on both characters. The plot lacked creativity, and that was the main problem with the movie. THe disease movies have been overdone and another one doesn’t make it different. Obviously, there are going to be complications in relationships. Obviously, there are going to be problems with the disease. It seemed like the only thing that made this movie different from other disease ridden young adult movies is the actual disease. Bella Thorne is not a good singer. Some actors should not sing, and she is one of them. The songs were so clearly autotuned, it brought down my expectations for the movie. The one song that was actually good was “Reaching.” This is the song that Katie sings when she first meets Charlie. Bella Thorne is also not the best actress. She tends to play mean characters a lot better than when she plays characters who are on the shy side. This role did not fit her at all. However, casting for other roles were done really well. Patrick Schwarzenegger was perfect for the role of Charlie. He looked like a swimmer, he had that movie star smile, and he is a terrific actor. Even Katie’s best friend Morgan, played by Quinn Shephard was perfect. Her acting made the audience feel the connection Morgan and Katie had as best friends. The ending was predictable, but there are only two ways that these movies end: either the person with the disease finds a cure, or they die. It wasn’t surprising because towards the end of the movie, the plot started to plateau, but the ending was the best part of the movie because it showed all the characters dealing with Katie’s death. The best part of the movie was when Bella Thorne’s character was killed off. Save your money and see a different movie! You are wrong. this movie is magical.